Blogger Integration at last !! 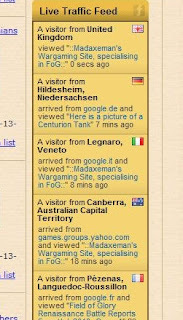 I've finally worked out how to integrate the design of Madaxeman.com into Blogger (which loads of wargamers use for their websites and to keep track of what;s going on). This may not sound like a big deal to any technophobes out there, but the practical benefit is that this site now has loads of additional ways for you to pootle around finding obscure, forgotten and random stuff that my lack of a coherent navigation system means might otherwise be forgotten and lost. It also means that anyone with a Blogger or Google account can do some clever linking and friending stuff to Madaxeman.com. Four New FoG:Renaissance match reports now on this site. See a Siege of Vienna Lifting Austro-Polish army take on the Anglo Dutch, The Dagestanians, the Ming Chinese and Someone Else. Report #2 includes Borat's analysis of the Dagestani Army, given in an exclusive live studio interview with CNN's Larry King. I've added a new widget to Madaxeman.com, which you can now see in the right hand sidebar of most pages. It shows the 10 most recent visitors, with details of where they are from, how they found the site and what pages they have visited. Each entry links to the page they have been looking at, so it's a great way to see what other people are interested in - and maybe you'll stumble across a few "hidden gems"* on the site too? (* "hidden gems" translates as "yes, I know the navigational architecture is shocking. But whaddya expect?"